Figure 1: Illustration of the high-pressure synchrotron x-ray diffraction experiment carried out in the diamond-anvil cell (left) at Beamline P02.2. Brillouin scattering set-up (right). The greenish “glowing” of the diamonds is induced by the incident laser light that is used to probe the sample at extreme conditions. Figure 2: TEM micrographs. 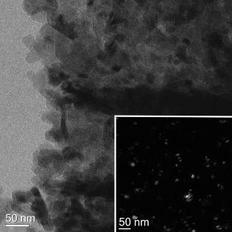 Bright field image of a representative area of the nc-MgO sample. The inset in the lower right corner shows a dark field image of a larger region. The average crystallite size is about 20 nm. Figure 3: Pressure-dependence of the unit cell volume of nc-MgO measured using different pressure-transmitting media (i.e. different stress environments). Solid curves are fits to the experimental data. Both the average crystallite size and the experimental stress condition impact the apparent compression curve; both effects are qualitatively illustrated by the large arrows. Marquardt, H., S. Speziale, K. Marquardt, H. J. Reichmann, Z. Konopkova, W. Morgenroth and H. P. Liermann (2011). The Effect of Crystallite Size and Stress Condition on the Equation of State of Nano-crystalline MgO. J. Appl. Phys. 110: 113512. During the last decades, both extensive experimental and theoretical research has documented that the physical and chemical properties of polycrystalline solids are sensitive to the average crystallite size once it drops below a certain size, usually in the range of ~10-100 nm. This remarkable observation is related to both the different properties of the nano-crystals and the relatively large fraction of intercrystalline material. These observations open novel and unique ways to tune the physical and chemical properties of iso-chemical compounds by changing the average crystallite size. Unfortunately, our quantitative understanding of the effects of crystallite size on many properties is very scarce and hampers the design of these materials. 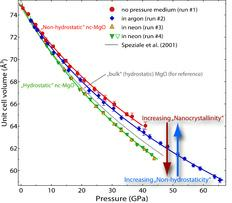 Here, we report the effects of crystallite size on bulk elastic properties at high pressure. Nanocrystalline (nc) MgO was compressed to very high pressures in a diamond-anvil cell at the new Extreme Conditions Beamline (ECB) P02.2 at PETRA III (Fig. 1) to study its elastic response to large compression. 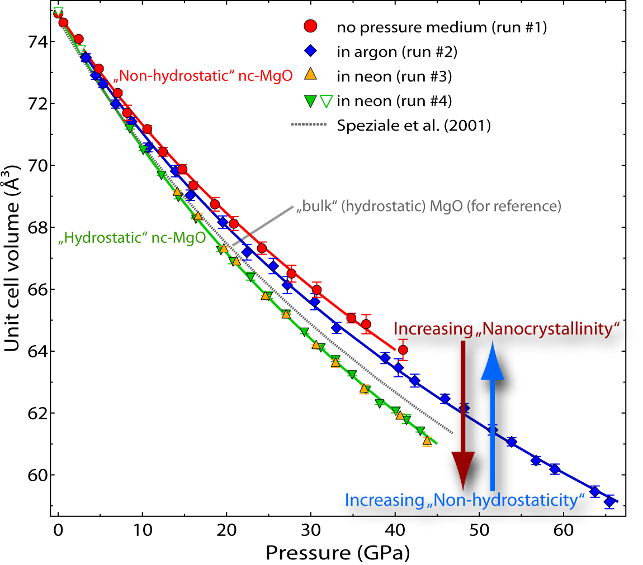 The average crystallite size of nc-MgO before and during the high-pressure experiments was quantified using both in-situ x-ray diffraction line broadening analysis and ex-situ high-resolution transmission electron microscopy (Fig. 2). Comparison of the derived data to high-pressure sound wave velocity measurements on the same material using Brillouin spectroscopy (Fig. 1, inelastic scattering of light by acoustic phonons) provides insights into the distinct contributions of both the crystalline and the intercrystalline fractions within nano materials to the overall elastic response; using both data sets, we provide first quantitative constrains on the compressibility of the crystalline cores and the intercrystalline material to high-pressures. We find clear indication that the bulk compressibility of nc-MgO is enhanced compared to bulk MgO, i.e. nc-MgO is “softer”. In addition, we show that the experimental stress condition has a profound impact on the apparent compression response; the magnitude of the effect is stronger than that caused by the nano-sized crystallites (Fig. 3). This observation sheds new light on previous compression studies that reported contradictory result on the potential effect of nanocrystallinity on materials compressibilities.